Place the blackcurrants, redcurrants, sugar and orange rind in a large pan. Cover and cook gently until the juices flow and the sugar has dissolved. Stir in the raspberries and loganberries or strawberries, and continue to cook for about 5 minutes until all of the fruit has softened. Remove from the heat and leave to cool. Cut a round from one of the slices of bread, large enough to fit in the base of a 1.7 litre (3 pint) pudding basin, then cut the remaining slices into three. Place the round in the bottom and then line the sides with slightly overlapping slices of the bread; reserve the remainder for the centre and top. Remove and discard the orange rind from the fruit compote. Spoon half into the lined fruit basin, then place a layer of the reserved bread on top. Add the remaining compote, then cover completely with the remaining bread, trimmed to fit if necessary. Cover the pudding with a small plate or saucer, which just fits inside the basin. Place some heavy weights on top of the plate. Chill overnight. To serve, gently loosen the pudding from the sides of the basin with a palette knife, then turn out on to a flat serving plate. 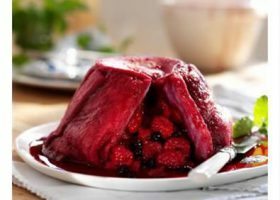 Cut the summer pudding into slices and arrange on plates with a dollop of whipped cream or Greek yoghurt.